Friday was the day that we've been looking forwards to and dreading for almost a year. Andrea and I couldn't sleep and were awake around 5:30am. I got up and moved some of our valuables and breakables to the new house in the first load in our SUV and then we got things opened up for contractors and went back to the rental to wait for the movers. At 8:00am the real craziness began. 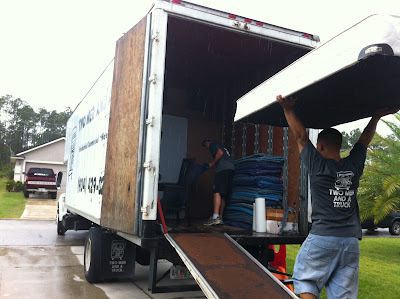 The movers arrived and we started to load up the truck. There were three of them and although we'd packed almost everything in to boxes, there was still a lot of work to do. We had to break down beds, take apart TV's, pack dressers, etc. 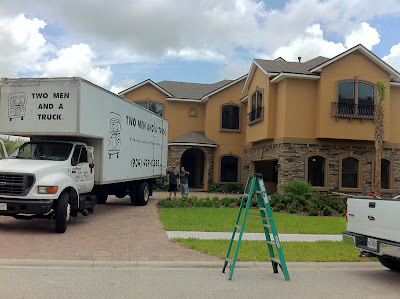 We hoped to get everything in one truck load, but after a few hours of loading we realized it would be too tight and we headed over to the new house for our first trip. At the house, it was crazy. We had LOTS of people in the house all at once doing all kinds of things. It was hard just to get the driveway clear so the truck could park. It was really chaotic too because we realized the painters in the Master Bedroom were in the way for everything that needed to go in the Master Bedroom and closets. All the furniture and clothes ended up in the office. The office furniture was scheduled to come the next day, so we temporarily filled the office full of odds and ends. The movers unpacked the truck, we made a second trip to the rental, cleared it out and moved the rest of the stuff. They unloaded that truck and were done with everything around 3:00pm. The rest of the day we unpacked stuff, moved furniture, broke down boxes, put together furniture, cleaned, organized, and ran around like crazy. We had nervous/frantic energy the entire day that was completely used up. We didn't settle down or stop until 11pm. It was a 17 hour day of non-stop action, activity, and hard work. By the end of the day we'd gotten an incredible amount done, but still had SO much to do. 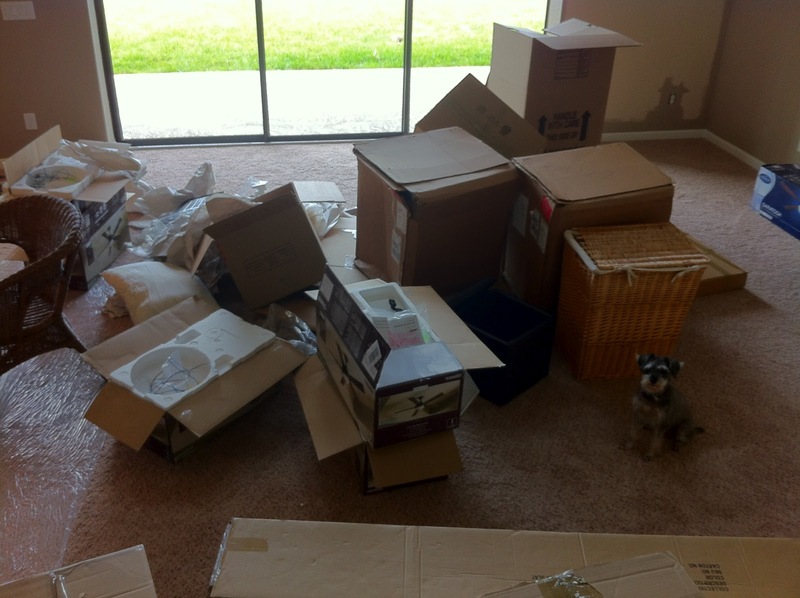 Chloe posed next to some of the many boxes that we stuck in the family room before disposing of them. On Saturday, the madness continued. DirecTV came out to install our TV service, Woodchucks came with our office furniture, Haverty's delivered the Family room couch sectional, chair and ottoman. We spent another LONG day unpacking, unboxing and organizing. On Sunday we continued to work. We were exhausted, but needed to get the house ready and safe for the children since Grandpa and Grandma were bringing them up in the afternoon. We put together bedrooms and tidied things up as best we could and thankfully the house was in reasonable shape when the kids arrived. Monday was another exciting day. Tropical Storm Debby came through and saturated the entire area. Of course, it was pouring rain in the morning as I moved the boxes and bags to the curb for the trash people. I counted over 25 bags of trash and a stack of broken down boxes that was came up past my belly button. I started the whole ordeal with a poncho on, however halfway through I was sweating like crazy and realized I could choose to either be drenched in sweat or in rainwater. Andrea took a picture of me when I finally finished. The rest of Monday, we had the painters back out to finish up the Family room and Master bedroom as well as Connor's room. The Dining room furniture was delivered along with all kinds of decorations and we continued to work on getting everything together. By the end of Monday, the Master bedroom is finally complete with furniture and some decor and the rest of the house is much closer to being done. The electricians also finished on the final fan. They got all of them in but the one in the Family room on Friday. They didn't have a ladder that was tall enough for the high ceiling in the Family room when they came out originally so they had to come back for a special trip just to put it in. 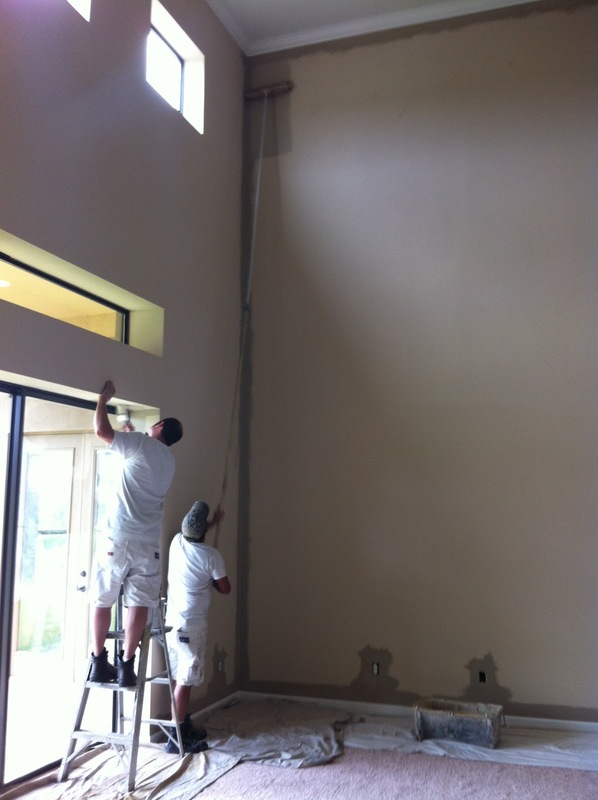 They had to go WAY up to put this fan together, this fan alone made it very worthwhile to us to hire out the job. We're pretty sure it's 22 feet up! Tuesday, we've got the stair carpet scheduled as well as our custom wall unit and console table and more decorations and furniture to put together. It's Monday night now and we're starting to see some light at the end of our move-in-tunnel.